This entry was posted in Uncategorized and tagged crime, criminal law, eye for an eye, incapacitation, punishment, removal, retaliation, retribution, vengeance by Nathan. Bookmark the permalink. There are now 9 comments... what are your thoughts? Except of course that “stealing one million” is often punished far less harshly than shoplifting or other petty theft. @Jeremy Uh, what is the source of your info? Although that is a common populist belief, Jeremy, it’s not really true. Here’s a link to something a brilliant — nay, godlike — legal mind wrote about this very misconception some years back. If anything, white-collar sentencing has gotten even stiffer since then. 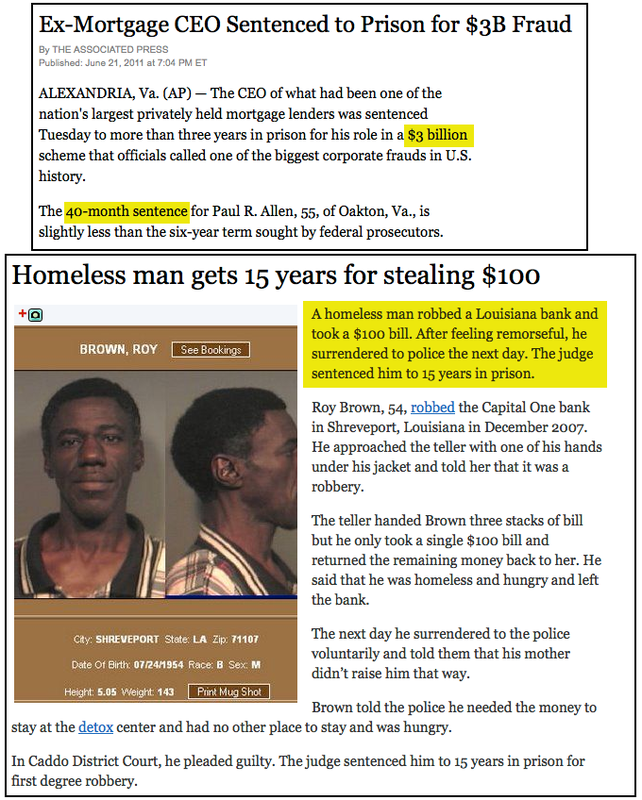 Of course, the reason why is obvious: a homeless man can’t afford the kind of defense attorneys that an “investment tycoon” can. Of course, there are some mitigating factors – let’s be honest, here, homeless guy pretended to have a gun, it sounds like. Armed robbery (even the threat of armed robbery) is traumatic for victims and thus generally considered worse than non-armed robbery. He also, unlike the tycoon, did not fight the charges, which means he never had the prosecutor bother to negotiate a more reasonable sentence in exchange for a guilty plea. But still, proportionally it does seem a little out of whack; especially when the more remorseful of the two, who returned the cash out of guilt and who was in a desperate state (you will notice the homeless guy was also, reportedly, in need of cash to stay at a detox clinic and for food), was the one who got the much, much longer sentence in comparison to the one who did it purely out of greed and returned apparently none of the massive amount he took. I think what bothers most people about this is there is no mention of parole here for the homeless guy who actually tried to make amends for his crime and turned himself in – and seeing as he’s already 54, 15 years could well be the rest of his life, especially if he’s already dealing with addiction and hunger. Granted, he’ll get fed plenty in prison, but I’m pretty sure we’d all agree the sentence was a tad harsh considering the not terribly high likelihood of recidivism in his case. Of course, all it takes is one pair of cases like that to skew public perception. A lot of it depends on timing and context, I think. I recently read a book (titled “the chickenshit club”, actually) about the justice dept and the prosecution (or, non-prosecution) of companies and, sorta, the difference between targeting individuals vs companies, settling out of court vs prosecutions going through to trial, no fault no blame agreements, and more. It may be things have gotten better or worse since that book was published, it may be sentences are harsher but prosecution is less common (as opposed to settlement, etc), it may be any number of things… but there is reason for the perception, and there were times/places where there was plenty to back that perception up. “Too big to prosecute” because taking them down would be the first domino to a global financial collapse. Or so the liars in the Justice Department would have you believe. Well, you could argue that by severely punishing minor crimes, the harm done both to the culprit (by the punishment itself) and to society (by rendering the culprit unable to contribute) exceeds the good done by keeping this person from jaywalking again. The page after this (introducing retribution) seems to be missing. Good catch! And you are the FIRST person (including me) to notice this glaring error since I ported the comic to this site 3 years ago! I hang my head in shame. You, however, deserve major kudos. I have inserted the missing image at the bottom of this page.